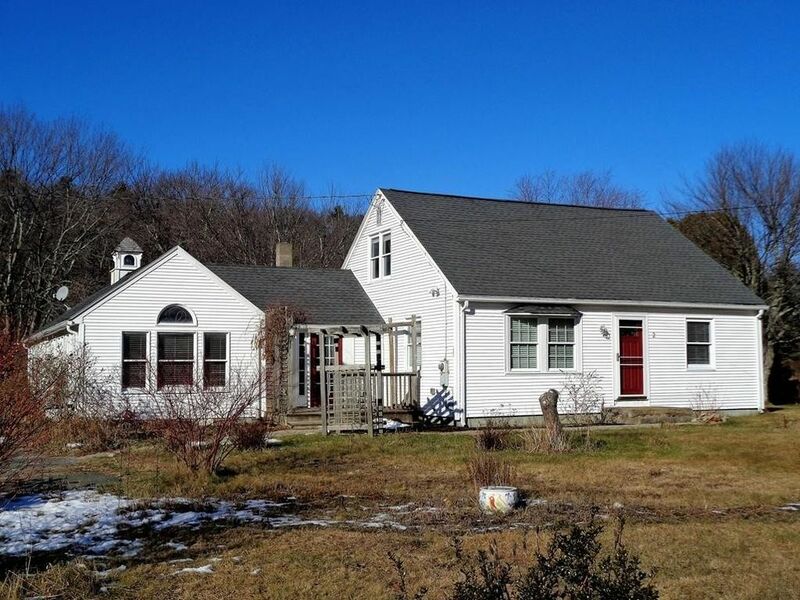 Artistic Cape with spacious family room and bonus room additions, near the center of historic Brimfield! Tiled, mudroom entry with plenty of space for all your snow boots and backpacks. Sun-filled kitchen designed by a baker, has a desirable open floor plan w/newer stainless steel appliances, 2 pantry closets, recessed lighting, butcher block & tiled counters, modern open shelving & HW floors. Dining room has HW floors, bead board, charming corner cupboard & glass French doors. First floor master w/HW floors & a fantastic walk-in closet. Cathedral ceiling family room w/cozy pellet stove (2015) and tiled floor, leads to a very spacious bonus room. 1st floor full bath w/walk-in tiled shower, custom vanity & wood floor dressing area. The 2nd floor has 2 spacious bedrooms w/wood floors and a unique 1/2 bath with an very cool glass bead floor. Spacious back deck, updated roof, siding and septic! Directions: Rt 20 to Brookfield Rd (next to Hitchcock Academy) left on Adams Dr, white house on the corner.